A play by John Guare, adapted from The Front Page by Ben Hecht & Charles MacArthur and His Girl Friday by Charles Lederer, performed at the Olivier, National Theatre, London: 5 June (previews began 29 May) - 22 November 2003. On 31 August 1939, days before Britain declares war on Germany, journalist Walter Burns is preoccupied by conflicts closer to home in Chicago. A notorious murderer has escaped from police custody - Walter could be on the verge of covering the biggest story in his career. Meanwhile, his ex-wife and star reporter, Hildy Johnson, makes an unexpected return to the press room, in order to deliver some startling news of her own. As Walter tries to win Hildy back, can she resist chasing one last scoop? This was the premiere production of John Guare's play, which has an unusual pedigree. It is based not only on another play, The Front Page (in which Walter's star reporter is a man), but also the film His Girl Friday (which spices up the dynamic between the two leads by making them ex-lovers). As a nod to the story's history on screen, the Olivier's stage resembled a film set, complete with the bustle of extras and make-up artists who fussed about the characters before the action began. Zoë realised very quickly that she would enjoy working on His Girl Friday. 'I just thought - this smells good. It smells fun - and I think theatre should be fun,' she explains (see 'Zoe Wanamaker: The Girl Can't Help It' interview). She trusted her instincts and accepted the part of wise-cracking Hildy. Extremely fast-paced, not least in the witty banter between Walter and his ex-wife, the production proved to be both exhilarating and exhausting to perform - 'a marathon', in Zoe's words (see her interview on Richard and Judy). She gave further insight into performing the play when the National Theatre invited her to discuss her career highlights at its In Conversation event. Every performance is a team effort, Zoë emphasised - 'acting is like a relay race'. His Girl Friday was part of the National Theatre's first Travelex £10 Season, in which the majority of tickets were reduced in price. The initiative aimed to encourage both first-time and occasional theatregoers to watch a performance, as well as making theatre more accessible to those on low incomes. It was a great success, and Zoe's next play at the National, The Rose Tattoo, was part of a subsequent £10 ticket season. Around the time she was starring as Hildy, Zoe became a National Theatre Associate, giving her the opportunity to contribute to the venue's artistic policy. 'There's always a great atmosphere here. 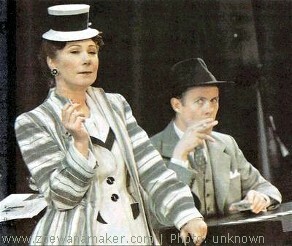 I love it,' she remarked at the time (see 'Zoe Wanamaker: The Girl Can't Help It' interview). Zoe clearly enjoys performing at the National and has worked with four out of its five artistic directors (i.e. Peter Hall, Richard Eyre, Trevor Nunn, and Nicholas Hytner). 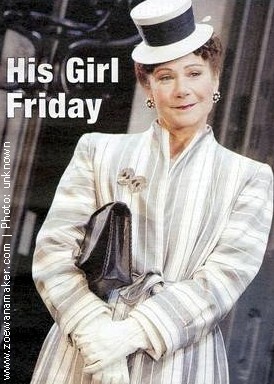 In addition to His Girl Friday, her other productions with the National Theatre Company include The Importance of Being Earnest (1982), The Bay at Nice and Wrecked Eggs (1986), Mrs Klein (1988), The Crucible (1990), Battle Royal (1999), The Rose Tattoo (2007), and Much Ado About Nothing (2007). His Girl Friday delivers 'wave upon wave of comic pleasure', enthused Nicholas de Jongh in the Evening Standard. As feisty Hildy, Zoe is 'a petite dynamo with a glint in her eye', declared The New Yorker's John Lahr. Her performance is 'terrific', wrote Paul Taylor in the Independent. Michael Billington, in the Guardian, enjoyed the chemistry between the two leads: 'Wanamaker and Jennings play together like champions'. They 'make a crackerjack team', agreed Ian Johns, writing for The Times. In this sharp production, both are 'consummately stylish and effortlessly amusing', said Mark Shenton, writing for BBC London. Among the numerous other positive reviews His Girl Friday received: Susannah Clapp in the Observer, Sheridan Morley in the New Statesman, the British Theatre Guide's Philip Fisher, Lizzie Loveridge for Curtain Up, Neil Ludwick for Culture Vulture, and Matt Wolf in Variety.